Things are looking up (or rather down)! That big drop happened! Sometime Saturday night we'll see water levels begin to drop 6" or more. Doesn't sound like much but it's more than enough to get significantly more sandbars above water. At this point, trips beginning Sunday and beyond are good to go! If you've already got a reservation with us, you'll see your trip status reconfirmed. As a bonus, all hints of storms and rain have moved out of the 3 day forecast! Weather is looking ideal! I've rarely been so excited to see a lot of yellow on this chart! New updates are out and they look good. Kind of. In a very relative way. The weather forecast also looks to be pretty stable with small passing rain showers totaling less than a 1/4". We're just so close to that sandbar availability line that it hurts. So here's what we're gonna do: in the interest of safety first we're canceling Saturday overnight trips by default - BUT - if you've done this trip before and know what you're in for, willing to settle for what qualifies as a sandbar in the loosest sense of the word, likely share that sandbar with new river friends, and generally accept that this will be something of an adventure, we'll send you out. More details in your email. Starting Sunday morning and beyond, things are looking much better and I expect we'll be sending out overnight trips. -Ryan Quick update at 1:30pm - we're looking at another 1.5-2kcfs drop upstream tomorrow morning which would get to us in time for Sunday night trips. We're currently at 16.5kcfs (down from 17kcfs this morning/last night) in our area. Assuming this goes to plan, it would mean we're in the clear for Sunday and beyond as levels should settle at or below 15kcfs (our overnight cancellation threshold). Confirmation sometime tomorrow if/when that drop happens. While the storms were a bit of a wild ride locally, it looks to have spared a lot of central and northern Wisconsin. That said, with the new river predictions out in the last hour, we're just on the wrong side of where we need to be for at least Friday night trips. Saturday isn't looking great but it does look possible that we'll let people attempt Saturday night trips if they really want to (and the further we get into the week, the better the outlook), but for now, Friday night is officially out. Day trips will be in good shape. There are a number of places to pull off the river but with the high water levels, you're also able to get into a lot of neat backwaters that are normally inaccessible - this is especially great for wildlife sightings. Our neatly defined threshold of 15,000cfs is a little fuzzy in the real world. While there are technically a small handful of sandbars/islands out on the river right now, there just aren't enough to expect everyone to find a place to camp. 6" makes a huge difference at this level. If we didn't also have so much local rain that doesn't show up in the gauges and river predictions right away, we'd probably give you the option to try. As it is, we just don't know whether or not you'll wake up underwater at 4am Saturday morning. How will we know for Saturday night? We're currently expecting the dam 36 hours upstream to drop between 1-2,000cfs mid to late Thursday morning. If this happens, we'll check the new output against what's happening directly above us at Prairie Du Sac and if it looks like we'll stay level or drop close to that 15k number, we'll give the option. This is likely when you'll see my next update. In an ideal world, we'd see the graph below putting is in the white boundary. As it is, we can stand to be a little bit into the yellow, but we definitely want to be trending down. We're so close! 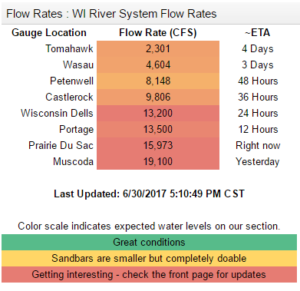 The latest river update avoids a spike in water levels, BUT, it's right on the line for where we'd cancel overnight trips. It looks like we'll have a handful of sandbars regardless but at this level, a few inches makes a big difference. Likely no decisions to be made until tomorrow morning after we have rainfall totals but it's certainly looking better than what I thought would happen. Assuming things stay as they are, we'd offer full refunds and recommend canceling but allow people to go overnight with the knowledge that they can't be picky about campsites. Ever wonder what life is like running a canoe company? Some people do. I've gotten questions ranging from "How many times have you been to the Boundary Waters?" (one) to "What do you do in the Winter?" (it depends) and my personal favorite "You must love paddling" (paddling is #4 on the list).